Home / Longarm Machine Rental / These Renters Love Triangles! I’m always talking about shapes here. Shapes are what make up the patterns of all quilts. Circles, squares, rectangles, even hexagons are used in quilting. These quilts are made up of triangles. Take a look! The first quilt is from Valerie called “Sequoia”. She made it with colors of the University of Louisville for her son. It certainly is striking. She quilted it with an edge to edge pantograph called Airborne. It has an open curvy feel like wind or clouds. Unfortunately, we no longer carry Airborne, but you should check out one of our new pantographs called Oh My Feathers. It’s very similar in style. She found the perfect backing fabric here in the shop, Chopsticks 108″ – Red. The pattern really ties it to the fabrics in the top. Donna made this quick easy top with blue and white quarter square triangles. As simple as it is, all those points can be difficult to match, and she did a great job! She quilted this during her certification class. She used the Kashmir pantograph, giving it an easy going pseudo flower that is very appealing. We hope to see more of Donna and her quilting talents in the future. 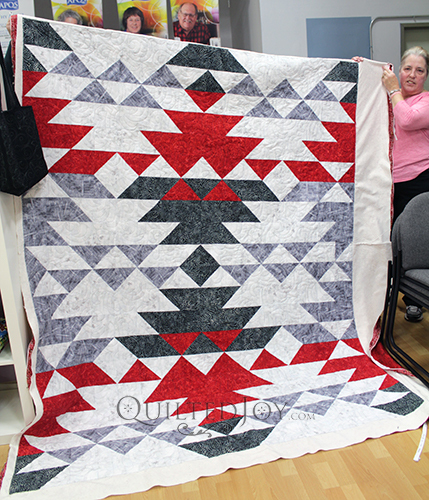 This stunning quilt was created by Pam. The design is simple enough, half triangle squares all placed in identical orientation to each other. The colors are grouped and progress through the rainbow starting with a dark red and ending with a deep purple. The way she quilted it is simple but effective. She made swooped jumps from corner to corner of each triangle. I love the backing she chose as well. Great job, Pam! This sweet little quilt was completed during a rental certification class by Linda. I like the muted blues that she chose to create this quilt. Its calming and gender neutral as a baby or lap quilt. It was quilted using the Kashmir pantograph just like Donna’s quilt before. The panto looks just as good here! Triangles are great shapes to play with when creating a quilt design. Try playing around with a few sometime and see what you come up with! Previous post: Thank You Claudia! Next post: Longarm Guild: Ruler Spotlight!